Liking gate isn't making any sense? So I turned liking gate for user directed on, and under romance I have the liking gate to 20, and under woohoo again I have it to 20. (some) Romance options are there.. but woohoo isn't? How does this liking gate work?? I put debugging on, and the options are there greyed out saying "liking gate fail".. how? at -100?? Not sure here, but it's possible that some time must pass after changing (as opposed to removing) the Liking Gate before Woohooer reacts accordingly. Hmm good idea, I'll boot the game back in a bit and to test gonna set liking gates for romance & woohoo to -100 and let some time pass. Then I can keep increasing the liking gate as I play until I get the values I want. Do you use the liking gate for user directed? What are your liking gate values? Am not anywhere near my game right now, but believe I have that one set for 40 and True for User Directed. I've had to adjust for some worlds though, in some it seems sims need a bit more encouragement while in others they need less. hey igazor, just to let you know you were right, after a while it solved its self. now i'm gonna play with the liking gates til i find a nice balance i like. because i want casual sims to be able to get their reward but don't want it so easy that uncasual sims accidentally get all casual. and likewise i don't want marriages and partnerships popping up after a couple of chats and a quick flirt, i want long meaningful relationships with a close historical bond. in SP I've also lowered base chance of affair to '2'. I've also lowered all the base chances of romance/woohoo options being chosen ('7' & '8' respectively). I can't get the image to show? Sorry for triple post it won't let me edit. I figured out the problem, it's 'trait scoring' which i don't understand. When debugging under romance actions it says 'liking gate fail' but it isn't, as i turned liking gate off and it's still greyed out. I turned off trait scoring for user directed and now woohoo/try for a baby is showing on the bed. But I turn it back on and again greyed out. Why is trait scoring affecting married sims so much? 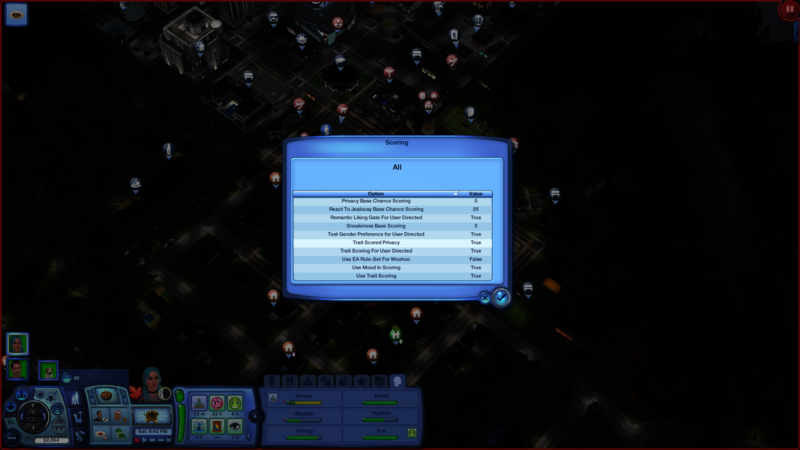 With trait scoring on (and then again off), what kinds of attraction scores do you get on these two sims when running a Scan Room on them when they are both in the same room? Just because they are married doesn't necessarily mean they are highly attracted to each other or will always be interested in woohooing. Hey thanks for reply man. it says his name then her name below on both windows that pop up, but one is like 233 and the other was something like 160 something? But in rship window they both have full bars.